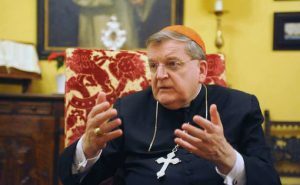 ROME, Italy, August 30, 2016 (LifeSiteNews) — It is “highly questionable” to say Catholics and Muslims worship the same God and Islam is a religion of peace, Cardinal Raymond Burke said on a call with reporters Monday. Burke, an American, is the former Prefect of the Apostolic Signatura, the Vatican’s highest court. He is now the patron of the Sovereign Military Order of Malta. Burke was speaking to the media about Hope for the World: To Unite All Things in Christ, a newly-published book-length interview with French journalist Guillaume d’Alançon in which the prelate weighs in on a host of controversial topics such as contraception and its relationship to abortion, transgender bathrooms, Holy Communion for the divorced and remarried, and problems within the Catholic Church. Nostra Aetate, the Second Vatican Council’s declaration on the Catholic Church’s relationship with other religions, “is not a dogmatic document,” Burke said. Burke was responding to a question about whether Catholics and Muslims worship the same God and whether Catholics are bound to believe Vatican II’s definition of Islam. The recognition that Nostra Aetate is not dogmatic may lead the Society of St. Pius X, a traditionalist group with an irregular canonical status, to full Communion with Rome. Many Catholics view the contentious Vatican II document as unclear or even at odds with Church teaching on Catholicism being the one true faith. 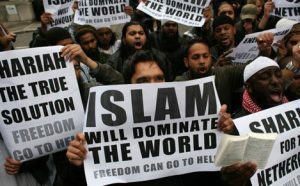 Whether Catholics must embrace Islam as a religion of peace or be considered dissenters was a recent topic of debate between Robert Spencer of JihadWatch.org and Monsignor Stuart Swetland of Donnelly College. The former claims that Spencer’s position that Islam is inherently violent is at odds with the magisterial teachings of recent popes. Supporters of Spencer point out that popes have had varying opinions about Islam throughout the years and that affirming a certain nature of Islam is not related to Catholic faith and morals and therefore is not binding for Catholics. They also say that Catholics should consult Islam itself to determine its nature. If “God is love,” how can He be “the same God that commands of Muslims to slaughter infidels and to establish their rule by violence?” Burke asked. “Let’s examine carefully what Islam is and what our Christian faith teaches us,” said Burke, because they’re not the same thing.